The shot that will kill me … and the one that I haven’t really gotten over … was 109-107, under a minute-and-a-half to play, T. J. [McConnell] drove baseline and hit me on the wing and I probably got my best look I got all series. And, uh, I just missed it. That would have put us up five, in Game 5 … at that point I think we would have had a really good chance to close out that game. I think it was 2011, Atlanta in the first round, Game 6 … and we were down two and Stan [Van Gundy, then coach of the Orlando Magic, for whom Redick played at the time] set up a little play for me to come off a little pin-down from Dwight [Howard] … and [I] missed it left, and we lost the series on that play. Those are the ones, when you look back on your career—yeah, I’ve hit game-winners, I’ve hit shots to send games into overtime, I’ve hit shots that, you know, put the game away … you hit clutch shots … you remember the ones you missed, though. Those are the ones that just haunt you, that you think about all the time. In Matthew 16, Jesus tells his disciples to “be on your guard against the yeast of the Pharisees and Sadducees” (v. 6). Some years later, Paul is writing to the Galatians and telling them to, similarly, beware of what he has called “the circumcision party.” He, too, uses a bread-based analogy, saying, “a little leaven leavens the whole lump” (5:9). 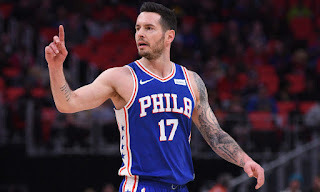 Jesus and Paul are making the same point that J. J. Redick is: a little Law (criticism or judgment) can make you forget all about grace. A few years ago, a man visited my church for the first time. He came up to me after the service and went on and on about how much he’d loved the service. He’d loved the music, and the sermon, and the friendliness, and everything about the place. Well, except he just had one question: why, he wondered, during the Prayers of the People, did we pray for the President of the United States and the Governor of the State of New Jersey but not for the mayor of our town? Didn’t it make more sense for us to pray for the people who had more direct political influence over the lives of our parishioners? Notice, all these years later, that this story has stuck with me. I don’t remember what he’d liked about the music, or what he’d liked about the sermon. But I remember specifically what he didn’t like about the Prayers of the People. As he walked away from me, my overall feeling about the interaction was a negative one, rather than a positive one. After all, he’d criticized my church. A little leaven had leavened the whole lump. You know what I’m talking about. My little Prayers of the People story immediately brought up some incident in your life where one word of criticism overwhelmed a heap of praise. We humans are so attuned to these bits of leaven—the yeast of the Pharisees and Sadducees—that we latch on to them to the exclusion of anything else. This is why, as proclaimers of God’s Good News about Jesus Christ—whether we find ourselves in pulpits on Sunday mornings or not—we cannot let even a word of Law taint that proclamation. Come unto me, all ye that travail and are heavy laden, and I will refresh you (Mt 11:28). God so loved the world, that he gave his only-begotten Son, to the end that all that believe in him should not perish, but have everlasting life (Jn 3:16). This is a true saying, and worthy of all to be received, that Christ Jesus came into the world to save sinners (1 Tm 1:15). If anyone sins, we have an Advocate with the Father, Jesus Christ the righteous; and he is the perfect offering for our sins, and not for ours only, but for the sins of the whole world (1 Jn 2:1-2). There’s not a word of criticism there. No exhortation. No leaven. This lump must not be leavened. The urge to introduce just a little yeast is strong: don’t people need to be told how to live now? Don’t they need to be shown the way? Martin Luther likened this attitude to thinking of the Law as a cute kitten. Surely, letting this kitty out of its cage won’t cause any problems, will it? But the Law isn’t a kitten; it’s a lion, and it will devour you. A little leaven will leaven the whole lump. A little criticism overwhelms a heap of praise. One missed shot crowds out dozens of makes. So let us celebrate Christ’s unleavened bread: It is finished. Three words, no strings attached. In him, there is no criticism. In him, there is only comfort.